Our persimmons are oriental varieties, the type usually sold in markets. Persimmons need little chill and they are cold hardy to USDA Zones 7 to 10. The trees are a great addition to the landscape. They have lovely fall color and, after the leaves drop, the bright orange fruits remain on the tree. The prime difference in varieties involves whether or not the fruit is astringent. If it is, it must ripen to the soft stage to be edible. For ideas on using and preserving persimmons, Elizabeth Schneider’s book Uncommon Fruits & Vegetables is very informative. Persimmons are used in puddings, cakes, cookies and salads. They taste like candy when dried and, for an unusual breakfast, add some sliced Fuyu persimmons and a handful of pomegranate seeds to your bowl of cereal! Small to medium size persimmon, oblong with bright red skin. Sweet, spicy, firm brown flesh with superb flavor - the choice of connoisseurs. Astringent until ripe. Fall harvest, late October through November. Cold hardy to zone 7. 200 hours. Self-fruitful. On Lotus rootstock. From Japan. Earliest known variety to ripen in California. Ripens a month before Fuyu; mid September to mid October. Medium to large persimmon, almost round, non-astringent fruit is eaten while still firm. Has unique, spicy-sweet complex flavor that contrasts with the delicate, sweet flavor of Fuyu. Each fruit has four or more seeds, developing a sweet, juicy, chocolate brown flesh. Cold hardy to zone 7. 100 hours. Pollenized by Chocolate or Saijo. On Lotus rootstock. 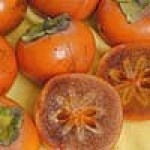 Medium sized, non-astringent persimmon with flat shape, still hard when ripe. Cool or hot climates. Hardy, attractive tree, practically pest free. Fall harvest, mid October through November. Cold hardy to zone 7. 200 hours. Self-fruitful. On Lotus rootstock. Larger, sweeter, juicier and not as flat as Fuyu. 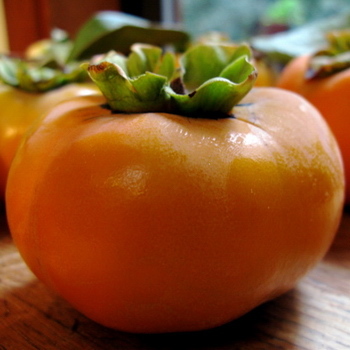 Firm when ripe, sweet, flavorful, non-astringent persimmon. Easy to grow in cool or hot climates. Cold hardy to zone 7. Fall harvest, mid October to mid November. 200 hours. Self-fruitful. On Lotus rootstock. Large, deep orange red, acorn shaped persimmon. Hot summer required to ripen fruit. Sweet, flavorful, astringent until soft-ripe. Productive, ornamental. Late harvest, mid Nov. to early Dec. Cold hardy to zone 7. 200 hrs. Self-fruitful. On Lotus rootstock.